Today, when it comes to live coverage of sports, storytelling has reached new heights of ingenuity. Super slow motion replays, multiple views of the stadium from incredible angles, real-time statistics and cutting edge snippets are all part of the standard viewing experience. For the production team in the control room, switching between ISO (isolated) feeds from 30+ individual cameras is the norm. And while only the final output from the switcher makes it to television screens, individual ISO recordings have immense potential to help create meaningful stories and highlight packages during or after the event. The right technology stack can help leverage these for offering audiences an enhanced viewing experience, thereby boosting monetization opportunities. Instant clip creation: Users can mark in/out segments related to specific movements of play, such as penalty kick, corner kick, volley, dribble etc. These can be instantly sent via CLEAR for transcoding and delivery to chosen publish destinations. VoD/OTT platforms (like YouTube or Facebook) can easily be configured on CLEAR, and playlists can be published with ease. Creation of highlight packages from live and library content – Built on CLEAR’s powerful MAM system, Story Teller help discover points of interest within seconds - even from a deep archive or a remote location. 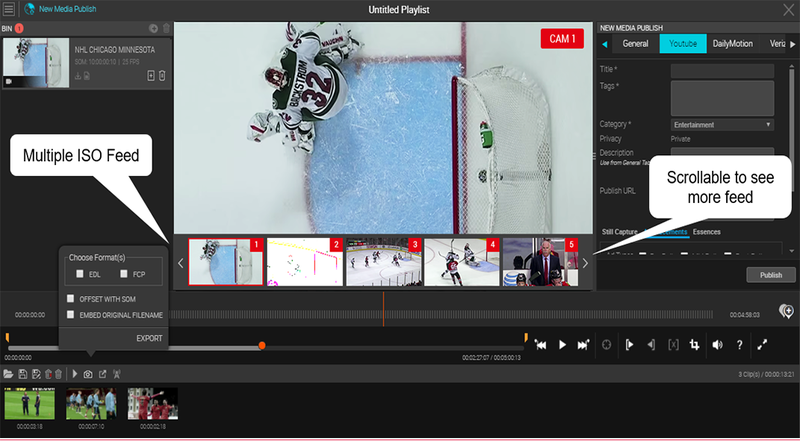 These can be combined with live footage to create different theme-based highlight packages such as Goal Highlights, Goalkeeper Game Saves etc. Metadata creation & publish: After the creation of VoD packages/clips, users can enter metadata and publish the same to a chosen destination. Data Overlays – CLEAR can integrate with 3rd party data feeds, to overlay live data tags on its player timeline. Based on these tags, users can filter data and quickly add segments to VoD packages. CLEAR integrates with these data feeds to include elements like match fixture (details of teams playing against each other), match line-up, match results and match commentary. Generate a downloadable XML file that editors can use while editing the corresponding video on a non-linear editing (NLE) system like Final Cut Pro/Adobe Premiere Pro. 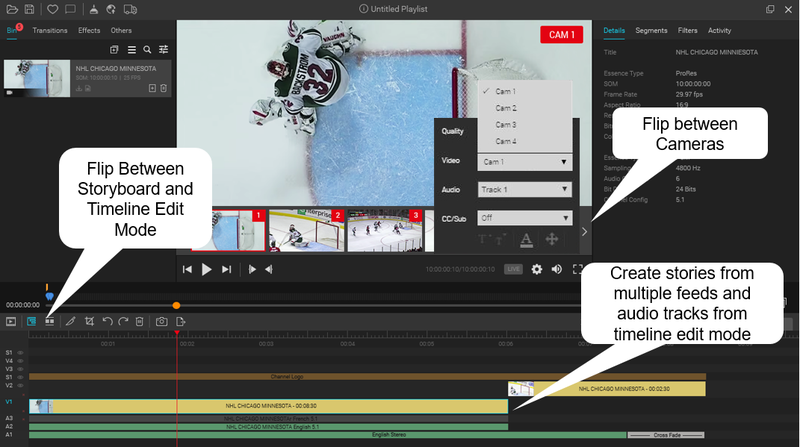 Story Teller is now being enhanced to include support for multiple ISO footage functionality, wherein it will provide a seamless editorial experience. All ISO feeds from multiple cameras will be synced using the same clock reference or ‘Time of Day’ time code. With synchronized feeds, users will have the ability to flip between different ISO feeds of the same segment for a given time period. Storyboard Edit Mode: The different ISO feeds will appear as thumbnails, which will be generated after a fixed time interval. Once the user chooses a certain camera angle, the video will play from that particular time code in the main player. Users will have the ability to switch between any of these ISO feeds, and create stories from the one that they need. This mode can be used to switch between multiple feeds and create playlists within a short timespan. Timeline Mode: This is a more advanced editing mode, ideal for working with multiple video, audio, and image files. In this mode, users can not only flip between different ISO feeds, but also use different audio tracks to marry the audio with the video, leveraging different camera angles to create riveting stories. With the live video streaming market estimated to grow to more than $70 billion by 2021 (PR Newswire), solutions like Story Teller can help content creators deliver greater value to their customers. Whether it is sports, news or any other content created using multi-camera setup, Story Teller helps take live coverage storytelling to the next level. Be it game analysis, panel discussions, snippets from outside the ground pre-kick off, interesting trivia/statistics, replay of critical moments or instant clip creation for highlight packages, Story Teller can help engage fans like never before.